there are bound to be some folks reading who remember the days before microsoft windows, and the existence of a computer operating system that pretty much gave bill gates his economic start in life. international business machines, more commonly referred to as ibm, owned an operating system (the software that makes a computer work), rather obviously named pc-dos; personal computer - disk operating system. the job of this was to pop over to the hard disk periodically and acquire the resources required by whatever program was running at the time, or perhaps to write some information to the disk when the operator clicked save. i'm simplifying greatly here, but this is supposed to be about bicycles, so just bear with me for a moment. bill gates' figured that he could improve the efficiency of this operating system, and persuaded ibm to let him tinker under the hood. as a precocious programmer of his age, young bill managed to do exactly as he had set out to do, renaming the new, improved version ms-dos; microsoft disk operating system. and in one of the great deeds of derring do, he had the good fortune to license it back to ibm. unlike either windows, linux or mac osx, dos required the user to type commands in luminous green lettering on a black screen to open programs, and was utterly mouse-free once those programs were running. clunky would be a good adjective to use, and required more than just a basic knowledge of how to switch a computer on at the back. although some bits were relatively easy to use, they were also very easy to get wrong, and when windows happened along, even though windows 3.1 used to fall over with incredible regularity, many breathed a sigh of relief. windows was based on the mac operating system devised by steve jobs and steve wozniak, which in turn was based on a graphical user interface developed by xerox palo alto research center. suddenly the future had appeared, and point and click has developed from that point onwards. yet in the early part of this century, with windows still sitting on top of dos, there were still those who laughed in the face of point and click, preferring to get down and dirty with that command line interface. these folks can't really be described as luddites, since we're talking about computers, and luddite seems a less than apposite term in such context. 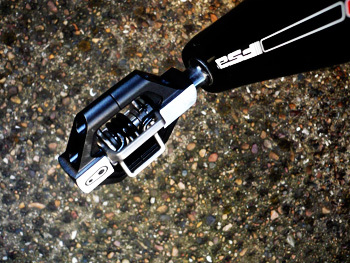 look style road pedals are the dos of the pedalling world. a contentious remark if ever there was one, but let me explain. road racing is steeped in tradition and heritage, a state of affairs that has often led, if not to a slowing of technological development, then perhaps a hesitation in accepting the new when it happens along. for many a long year, and still the case for many track riders, the foot was clamped to the pedal by means of toeclips and straps. as recently as my first attempt at the london-paris ride, there was a happy chappy who rode the entire 600km with feet encapsulated in just such an archaic system, and my editor still swears by them (or, on occasion, at them). but although a cleated shoe affixed to a development of the ski-binding can reasonably be accepted as a logical development of the toeclip, it still suffers from the same malady, namely upsidedowness. no matter how the pedals are left at time of dismount, they are almost guaranteed to be sitting clip side down. and if you have to make a hill start, on alpe d'huez for example, full power will have to wait a few metres until it's possible to gain enough speed and an appropriate technique to get the darned foot clipped in. offroad is seemingly a differing state of mind. for the sake of my own sanity and in keeping with my tentativeness over approaching the world of the knobbly tyre, we'll confine this to cyclocross, about which i know a bit more, even if my efforts in that direction would not be out of sorts in a pantomime. what cross does have in common with mountain biking is a need to unclip quickly and vice versa. you can imagine the consternation and mayhem if leaping aboard that saddle was rendered null and void by a desperate need and possible failure flipping the pedal the right way round. would it not be so much more efficient if the pedal was always in the right way up, even if you weren't? the sad part here is that i was unaware of my pedalling disadvantage and ignorance until the ibis hakkalugi arrived with two pedal options from crank brothers; the graphically named eggbeaters and variation on a theme, the candy. 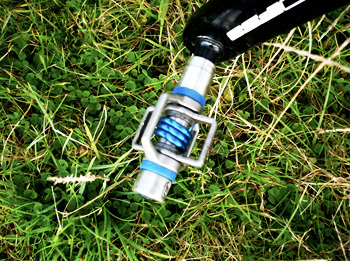 the basic pedal design does indeed resemble an eggbeater, consisting of a spring loaded cage that rotates on its axle, presenting four separate points of entry for the rather miniscule cleat. now i believe that there are cleats available to fit the three point look-compatible fittings on normal roadie shoes, but i have yet to try those with the crank brothers pedals, so for the time being we will have to concern ourselves with the little offroad cleat that fits shimano spd shoe fittings. road cleats are positively gargantuan in comparison to the eggbeater cleats, and with the latter being recessed into the sole of the shoe, i had grave doubts about matching one to the other. it doesn't always work first time on my road pedals and i had this mental picture of having to find a descent the length of mont ventoux to give me enough time to clip in before reaching the flat stuff. surprise, surprise, it's even simpler than i thought. even with my celebrated six million dollar man (slow motion) leaping aboard the ibis, i have rarely failed to clip in before forward motion has ceased to exist. the eggbeater is the naked mechanism, offering little support for the foot, relying more on the stiffness of of the shoe's sole to aid downward pressure. however, just recently i have substituted the eggbeaters for the candies, and experienced an improvement in foot comfort as a result. the method is so frighteningly simple, it will make your ankles weep; the candy is simply a small platform bolted roundabout that basic eggbeater mechanism, but still allowing the latter to rotate inside. thus there is no difference in how easy it is to clip in. weight weeniness may hold you back from the candies as they are apt to add a few grams to the equation, but if you were never that fast in the first place, or where a decent haircut would save just as many, if not more grams, then who really cares? and unlike scores of road pedals, all the crank brothers ranges can be completely rebuilt using kits that are readily available for your bike shop to order from distributors 2pure. there will be those who prefer the pain and suffering of flipping the pedal right way round, considering eggbeater wimps to have no soul and edging uncomfortably close to couch-potatoeness, much like adherents to the dos command-line interface. i'm a mac user and rather enjoy anything that means the trials and tribulations are taken care of by someone else. in this case, the crank brothers. 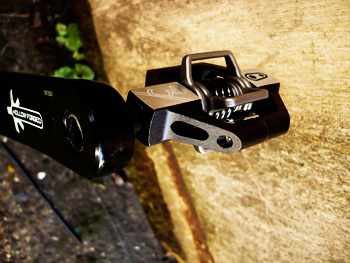 crank brothers eggbeaters come in four flavours; one, two, three and holy sh*t batman. 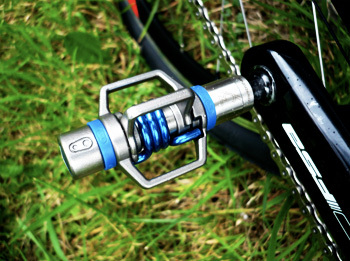 those tested were the eggbeater threes, retailing at £94.99, but the ones cost £45.99, twos are £69.99 and the all-titanium holy sh*t batman eggbeater 11 costs a whopping £379.99. candy pedals are also available in four flavours: ones at £45.99, twos at £69.99, threes (tested) £94.99 and the holy sh*t batman candy 11 at £299.99. as the saying goes, you pays your money and takes your choice.